Springtime is here, which also means warmer days and perfect hiking conditions. Here you get some information about the different hiking opportunities in the South Chilcotin Mountains Park. You can find approximately 200 km of trails in South Chilcotin Mountain Park, which can give you easy access to wonderful mountain lakes, ridge walks and broad valleys. Hiking is one of the main activities in the park . 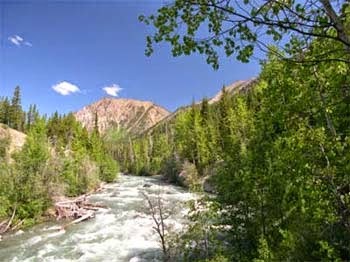 The main hiking trails head for Gun Creek and Spruce Lake is at Jewel Bridge. The first portion of trail follows Gun Creek with an elevation gain of 450 m. Continue along Gun Creek with an elevation gain of 200 m to the junction with trails to Deer Pass and Warner Pass. Hummingbird Lake is about 5.5 km and Trigger Lake at about 9 km pas the Spruce Lake Main junction. Taylor Pass is 12 km past Trigger Lake with an elevation gain of 500 m.
This hiking trails starts near the west end of Trigger Lake, following Warner Creek with an elevation gain of 250 m to Warner Lake. Warner Pass is reached after an elevation gain of 500 m.
The High Trail is extremely scenic, passing through extensive alpine meadows with high mountain vistas. This trail starts near the south end of Spruce Lake, off the Spruce Lake Main trail. The trail is ending at the south end of Tyaughton Lake. This trail features open grasslands, moderate grades and spectacular views. The trailhead is accessed by the Mud Creek Forest Service road. The confluence with Spruce Creek is about 12 km up the trail, which continues along the Tyaughton Creek valley bottom for another 13 km to the mouth of Lizard Creek. The trail continues to follow Tyaughton Creek for another 6 km, gaining 600 m in elevation to Elbow Pass. What you should be aware of is that some of the hiking trails sections are steep, wet and difficult to see. Weather in the park can change quickly, and you can actually experience sun, rain and snow on a summer day. In many locations you will be far from any help so do better be careful! Also the wildlife is out there and if you don’t know how to react in the situation of a bear encounter it can get dangerous.